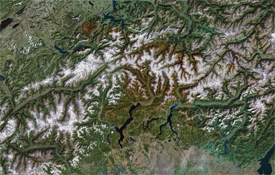 Is Pending Italian-Swiss Border Change Due to Alpine Glacial Melt a Global Harbinger? To alpine enthusiasts and avid climbers, the Matterhorn, the picturesque iconic mountain straddling the border of Italy and Switzerland, is a place of sheer beauty as well as perilous challenge. However, to European climate scientists and geographers the mountain is a dramatic reflection of global warming, with glacial melt in surrounding terrain and along other portions of the border, prompting the Italian Parliament to consider legislation redrawing the line of demarcation first set by the two countries in 1861. The exact nature of this new border would be determined by officials from both Italy’s Military Geographic Institute and Switzerland’s Federal Office of Topography, and although it would involve moving it up to 100 meters in some places, it would not lead to any displacement of the region’s inhabitants, nor would it result in forced changes in citizenship. Once detailed geographical considerations are agreed upon, the new demarcation may be imminent, as the Italian bill could become law by the end of April, and the Swiss do not require high level parliamentary approval for such issues. Certainly a peaceful change of borders among friendly countries like this one will be viewed as an example of how nations can come to terms with the transformational forces of global warming without resorting to violent conflict. But what do such transformations portend for regions straining (or soon to strain) over scarce resources? When coupled with depleting sources of fresh water and oil, as well as access to valuable Arctic shipping lanes, large scale ice and glacier melt may some day trigger widespread conflict over such flashpoints as Kashmir, the mountainous Indian-Chinese border region, and perhaps even the Northwest Passage, which may soon come into play due to retreating Arctic ice. The vast glaciers that straddle the Sino-Indian border, which may some day themselves melt and lead to a resurgence of conflict between China and India, and according to James R. Lee, Ph.D, Director of the Mandala Projects (including the Inventory of Conflict & Environment), a research consortium at American University, and expert on how global climate change leads to international conflict, glaciers within the Kashmiri region play a direct role in the current conflict between India and Pakistan, as they are major sources of fresh water for both countries. If those glaciers melt and are no longer replenished, widespread flooding would occur, followed by severe drought, as the meltwater that currently feeds the region’s major rivers would be dramatically depleted. The current situation is such that Pakistani leaders are accusing India of preventing Pakistan access to the Chenab, the Kashmiri river which is the major source of water. In speaking on the current water crisis in Pakistan, President Asif Ali Zardari recently stated, that “Resolution [of this dispute] could prevent an environmental catastrophe in South Asia,” but that “failure to do so could fuel the fires of discontent that lead to extremism and terrorism.” Perhaps there could be no clearer words than President Zardari’s, to awaken those who challenge the notion that widespread global climate change even exists, let alone that it can lead to worldwide suffering and conflict.